For me, white lace dresses are the epitome of summer. It’s the chance to really show off your tan or, in my case, pasty limbs. My only real chance of wearing a white lace dress is on holiday where if the sun has been shining, my freckles will have come out to play and I might have a golden hue. Then and only then, do I allow myself to pull out that dress. The dress in question is quite an old one now. It’s from Topshop, is one shouldered with one long billowing sleeve and nips in at the waist before falling into a short skater skirt. It’s the perfect holiday dress. And now we’ve finally got a holiday to look forward to this year, I’ve taken this as the perfect opportunity to look for the best from around the web. The only thing left to decide is which one I most want to purchase. This is the ultimate bohemian summer dress. It’s soft, sheer in some parts, has beautiful lace sleeves and detailing down the side. It has an a-line skirt which I’m always a fan of and looks like it’ll have the perfect swish when you walk. I’m sold. Lace, tick. Mesh, tick. Crochet, tick. Scallop hem, tick. I’m a sucker for a shirt dress and this one is the perfect combination of pretty and preppy. Who doesn’t like a little shoulder action? Especially when the swing dress in question looks beach-to-bar ready. There’s always that one dress that goes one step further. 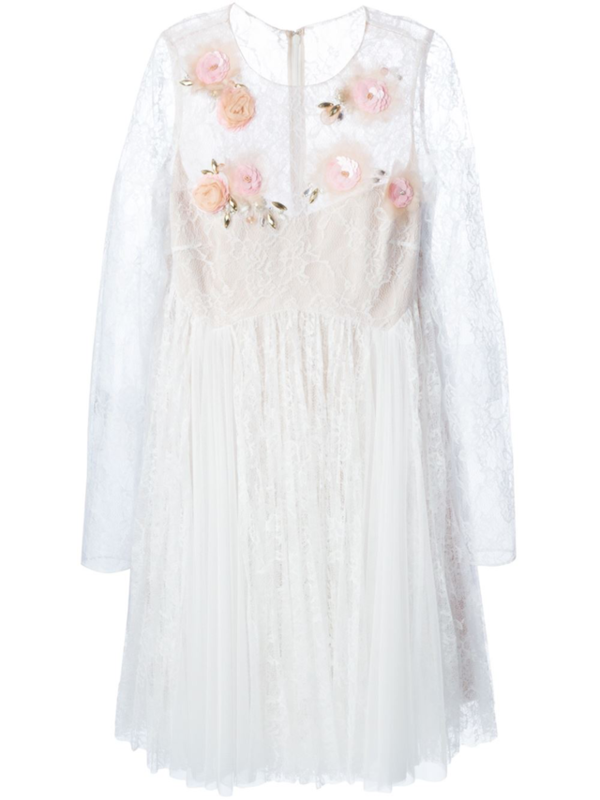 Sheer lace and delicate appliqué flowers make this Marchesa Notte dress sensational but very, very expensive.